theatre of noise: Induction Circuit live today! 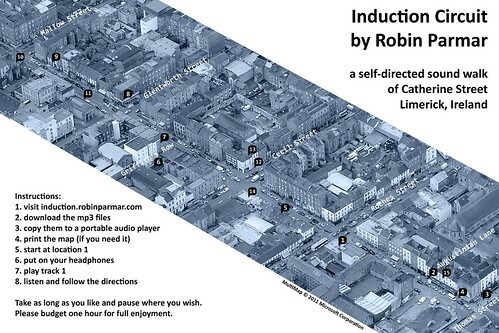 Induction Circuit is a self-directed walk that explores the secret domains and hidden sounds of Catherine Street (Limerick, Ireland). Setting off from a designated starting point with a music player and headphones, the participant is encouraged to experience new sonic geographies. Familiar territory becomes new again. All you need is some sort of a personal music player. Then go to the special website and grab the sound files. Download and print the map if you need it. Then allow yourself an hour and go on the walk -- I do hope you enjoy it! This piece was created for the ongoing Catherine Street DIG, 13-15 May 2011. I will be "in residence" at French's cafe early this afternoon to chat with people and help them out if they need it. If you bring your player and a way of connecting to a laptop I can give you the sound files on the spot.